Archive by Category "Steering and suspension"
Your customers may want to believe that noise was coming from the car next to them. Or they may just turn up the radio. But the tell-tale sound of a failing ball joint is a cry for help — and an OE quality replacement. Delphi is advising technicians to help ensure a quality steering and suspension repair by replacing the entire ball joint component where the rubber boot is split, cracked, damaged or missing. In these instances, there is a high probability that damage to the ball joint may have occurred, indicating the joint is likely to fail even after the boot cover has been replaced. 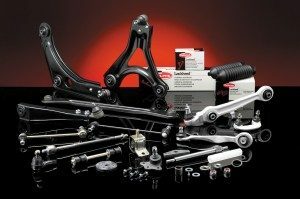 Replacing the entire ball joint component can help avoid potential premature failure, which can be safety-critical and costly. This can also help avoid potential warranty invalidations. By replacing the boot only and not the complete ball joint unit, the rubber boot could potentially seal in the damaging substances the joint has been exposed to, resulting in accelerated rust and corrosive damage to the joint. In addition, the ball joint is designed to operate with a grease lubricant. A defective boot could lead to a loss of this essential lubrication, as it may be washed away with water, dry out or become coated with dirt and other debris. Or use our contact form to send us an email!